Straight off the bat, I want to apologize for not delivering on my weekly free seo blueprint. It’s been 6 weeks since I wrote that post, so I might as well call this column “Semi-Bi-Monthly”, as redundant as it sounds. However, the SEO blueprint idea got a lot of buzz from the community, and I want to continue posting them. 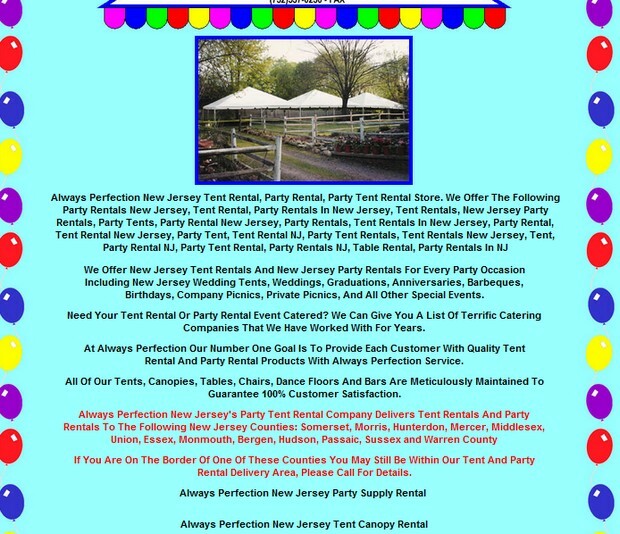 Today, we’ll explore the party rental industry in New Jersey. This choice is completely random, just because I see ConTent Party Rentals’ trucks on my way to work all the time. Shall we dig in? Aside from that, the entire domain lacks a healthy amount of content. Most pages barely have 100 words of content, and most of the time, that content is repeated on every page. In the report you see a comparison against a site in the very same industry that we built for a client on the Outer Banks. It’s a site that we havent optimized in almost a year, and it’s not their primary website. I was surprised to see the contrast. This report shows a great need for – of course – strong link-building. Yeah, link-building is the “magical pill” for SEO, but a deeper glance reviews absolutely no social presence, which can be an important source of domain authority. 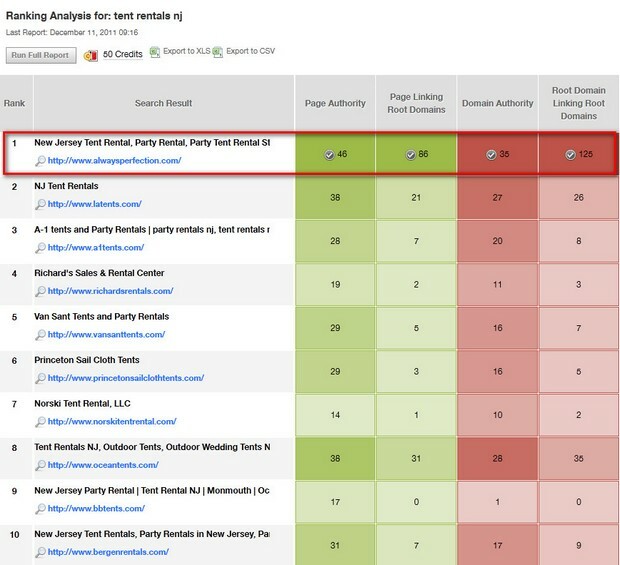 Even though Party Rentals has, by far, the biggest search volume, that keyword is very generic. Somebody looking for party rentals could be looking for tents, tables, chair, chinaware, or even just a popcorn machine for their children’s birthday party. It’s hard to asses relevancy in these cases, and often times, when chasing generic keywords we spend a ton of time and money without a clear idea of Return On Investment. After all, ROI is the only way to keep track of your search optimization team. So we’re going to look into the keyword Tent Rentals. Not just because it’s the 2nd highest volume keyword, but because it is targeted. And because it’s a large-ticket item with a great profit margin, one that usually triggers additional sales of smaller items, such as chairs and tables. Relevant link-building – most of their customers are corporations, that might have blogs. If they had a post about their party, they could link back to Content. Online, Content Party Rentals good certainly use a hand. The party rental industry is highly competitive, but focusing on niche services they have the opportunity to gain precious market share. And, with tents as their main service, generating a great return-on-investment wont be a problem. Now, I must say – we’re not working for Content Party Rentals or any other company in their industry. I picked their company randomly, and I can do the same for yours, if you want. Just leave me a comment and we’ll get our team on it! Finally – if you decide to use some of the ideas we shared here, at least link back to us and tell us how you did it in the comments. Very nice and informative article as I am looking for ways to improve my sites SEO as well. 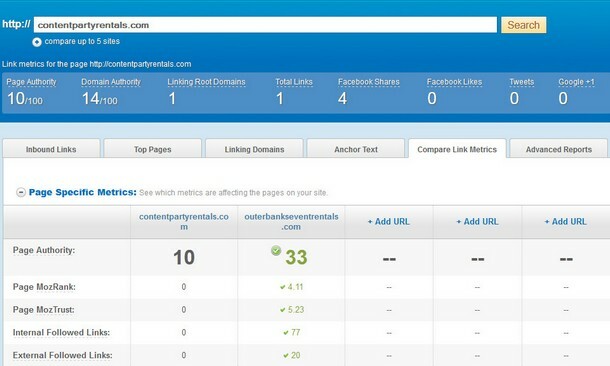 Thanks for the insite on targeting specific rather than broad search terms to gain traffic. Glad you found it valuable, Mike. Let us know if you have any questions, we’ll be happy to help.